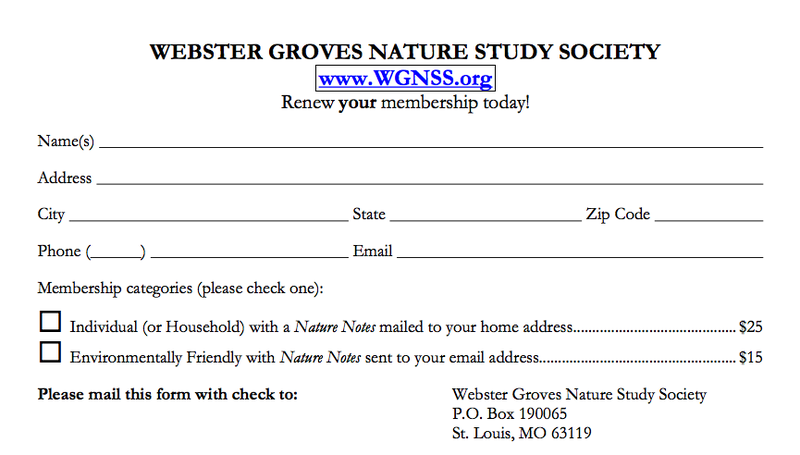 A guide for birders, prepared by Randy Korotev for Webster Groves Nature Study Society Join WGNSS! Like the common House Sparrow ("English Sparrow"), the Eurasian Tree Sparrow is not native to the United States. Both species originated in Europe or Asia and are in the family of birds known as weavers, which is unrelated to our native sparrows. In the 19th century, south St. Louis was the home of many European immigrants who wanted to see familiar birds from their homeland. So, on April 25 of 1870, twelve Eurasian Tree Sparrows were released in Lafayette Park in south St. Louis (Widmann, 1909; Lang, 1992). Numbers of other European birds were also released (European Goldfinches, Eurasian Bullfinches, Chaffinches, Greenfinches, and Linnets), but only the Eurasian Tree Sparrow successfully established a breeding population. In 1878 came the invasion of the more aggressive House Sparrow, which began to push the Eurasian Tree Sparrow from its established nesting areas. Expansion of the city also caused the Eurasian Tree Sparrow to spread, for it prefers suburban areas and open country. Today, there are still individuals in the city and a fair number in the suburbs. Most of the range expansion, however, has been to the north, along the Illinois River to at least Mason County, Illinois, and along the Mississippi River to southern Iowa. Some of the largest numbers are found in a remote location ~90 north northwest of St. Louis along the east side of the Illinois River north of the village of Meredosia (Cass Co.). I have not visited the area, but Anthony Lang, who studied the species for his Ph.D. dissertation, points out that there are hundreds of pairs nesting in tall silver maples along the Illinois River. More than a thousand birds have been reported on several occasions on the Meredosia Island Christmas Bird Count. Overall, the ETS is an uncommon species in the St. Louis area. This means that local birders might spend a whole day birding and not see one unless they make a special effort to visit a place where they are known to regularly occur. In my experience, the species is most difficult to locate in the heat of the summer, when visiting birders who are passing through town on their way to elsewhere want me to show them one. In summer, I would always recommend the Dogtown area discussed below as the first place to look. 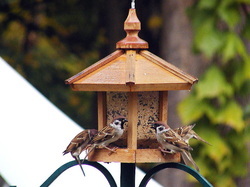 In the city and suburbs, the ETS often visits feeders, and sometimes a few are seen in flocks of House Sparrows. 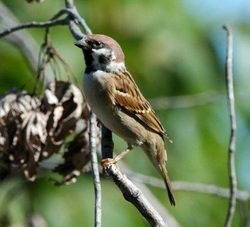 However in winter, Eurasian Tree Sparrows often group with others of their kind. Flocks of 50 or more birds can be encountered in rural areas, often in trees near water or in hedgerows or brush. On Christmas Bird Counts, it is not uncommon to find the Eurasian Tree Sparrow in the same habitat as the American Tree Sparrow. The ETS is easy to identify, but one useful point is omitted by most bird guides – the narrow white nape collar, partial or complete, which serves as a quick distinction from the House Sparrow at some angles. The call is reminiscent of the "cheap, cheap" of a House Sparrow, but is higher pitched and, to this observer, less obnoxious. The call note of the ETS, often given in flight, is a hoarse "tick, tick;" the call sometimes accelerates into a rapid chatter, unlike any sound made by a House Sparrow. If you are going to explore any of the sites below, I recommend obtaining a good (and recent) map of the St. Louis metropolitan area, particularly one that extends northwest into St. Charles Co. and east into Madison Co., Illinois. The maps I've provided here will help you get located, but they're not good enough to keep you from getting lost. After finding the ETS, stop and have a bite to eat. The Hill and Dogtown neighborhoods have the highest density of good restaurants in the St. Louis area. The Riverlands Environmental Demonstration Area (below) can be reached in 20 minutes by heading west on I-270, then north on MO-367. November, 2009: The last couple of times I was at North Riverfront Park, both in winter, I failed to find any ETS. However, a nearby reliable place is the Columbia Bottom Conservation Area, about 3 miles to the north. Check the bird feeders at the headquarters. (The feeders may not be stocked in summer. St. Louis County, Missouri area Locally, the ETS can be found in many of the suburban areas of St. Louis Co., although many reliable locations are in private yards with feeders. They occur regularly at the home of a knowledgeable local birder, Mr. Bill Rowe of Webster Groves, who is willing to have visiting birders watch his feeders. Call him at (314) 962-0544 for directions. His home is conveniently located within 5 minutes of I-44. Below are several publicly accessible sites. Orchard Farm Christmas Bird Count Circle. Another consistent place to find the ETS is the floodplain between the Mississippi and Missouri Rivers in eastern St. Charles Co. Much of this area, as well as part of the Aubuchon Rd. area of St. Louis Co. discussed above, is in the Orchard Farm Christmas Bird Count circle. I have compiled this CBC for 12 years. The count routinely reports the highest numbers of Eurasian Tree Sparrows of any CBC in Missouri; typically 20-30 observers see 100-300 birds (more than 700 were seen on January 3, 2000). The count is held on a single day, usually around New Year’s day. [Google Maps] The birds are usually seen in shrubs and trees along roadsides, in farmyards, in trees near the big rivers, and in weedy fields. They are usually not found in deep river bottom forests or open fields that have no cover. In winter, it is not uncommon to find flocks of a few to several dozen birds. Again, your chance of finding an ETS here in summer is less than in other times of the year, although they are undoubtedly present. It is probably not worth visiting this area unless you have half a day to spend and you want to combine your ETS search with other birding. The floodplain is a good place to find raptors and Lapland Longspurs in winter, and shorebirds in spring and fall (if it’s been wet but not too wet). The area is described in detail in Birds of the St. Louis Area – Where and When to Find Them, but here are a some brief guidelines. MO-94 is the main route through the county (blue road on ). From the west, follow the directions for the Aubuchon Rd. area, above, but continue west on MO-370 across the Missouri River and take the first exit, MO-94 east. Your route will be north, then east along or paralleling MO-94 until the roads ends at US-67 north of St. Louis at West Alton. MO-94 itself is not birder friendly because it is a busy road with no shoulders, but there are numerous side roads to explore. You will need a good map. Two areas worth exploring are the Marais Temps Clair Conservation Area (access on south side off Island Rd. ) and Grafton Ferry Rd., where it dead ends at the Mississippi River. When you get to US-67, head north and visit the Riverlands Environmental Demonstration area. Alternatively, visit Riverlands first, then drive MO-94 from east to west to St. Charles. Riverlands Migratory Bird Sanctuary (formerly, Riverlands Environmental Demonstration Area) . "Riverlands" was created by the U.S. Army Corps of Engineers as part of the building of new Lock and Dam 26R on the Mississippi River. Since its opening, it has become the premier place in the St. Louis area to see water related birds. It is the most accessible place in the area to see large numbers of Bald Eagles in winter. A remarkable list of rarities have been seen including Neotropic Cormorant, Wood Stork, Black-necked Stilt and most of the 19 species of gulls that have been seen in the St. Louis area. The area is described in detail in Birds of the St. Louis Area – Where and When to Find Them. Because the main road through Riverlands runs east-west and the river is to the north, viewing conditions at Riverlands are usually always favorable when the sun is shining. There are few trees in any of the accessible areas of Riverlands, so this is not a good place to find ETS in the nesting season. However, birders looking for more exotic fare often report seeing Eurasian Tree Sparrows in the weedy fields other times of the year. The Corps has bird feeders at the Visitors Center that often attract ETS. Madison and St. Clair Counties, Illinois area Horseshoe Lake area. Horseshoe Lake is in the Mississippi River floodplain just east of downtown St. Louis. ETS are routinely found around the lake, in adjacent agricultural areas, and even in semi-industrial areas south of the lake. Because this area is near I-55, I-64, and I-70, it is a convenient persons passing through St. Louis, either east to west or north to south. If you don’t have luck at Walker's island, return to IL-111, turn south (right), proceed 0.2 miles, and then turn left onto Schoolhouse Rd. After 0.4 miles, turn right onto Bruns Rd. Check the wires and farmyards. This has been a consistent stretch of road for ETS in recent years. Bruns Rd. ends at a T with Bishoff Rd. A left turn loops around back to a point north on Bruns Rd. A right turn brings you to Sand Prairie Rd. At Sand Prairie Rd. you can turn right to return to IL-111 (red loop on ) or left to go to the Cahokia Mounds State Historic Site. This site is a worthwhile visit and one of the most interesting cultural features in the area. Twenty years ago, ETS could be found nesting in the trees around the old visitor’s center. It is likely that some are still in the area, but I have heard no reports for many years. Frank Holten State Park. Frank Holten State Park, near Centreville, IL, has historically been one of the most consistent places to find the ETS. I saw my first ETS there in 1977 and on my last visit in May 1998 I saw several in a small tree in a parking lot near one of the lakes. The park is big and difficult to describe; birder intuition is required. The main road through the park has many pulloffs and parking lots to explore. Jersey and Calhoun Counties, Illinois area Jersey Co. ETS have been seen (east to west) in Elsah (check the feeders), Grafton, and near the river in Pere Marquette State Park [Google Maps]. To be honest, I have never seen one at any of these places, but I haven't tried hard. Acknowledgments: Thanks to Paul Bauer, Mike Flieg, Herb Grench, Ken Hartung, Anthony Lang, Bob Lamberton, John Solodar, Dennis Roach, Bill Rowe, Claudia Spener, and Bob Wells for providing information and directions. 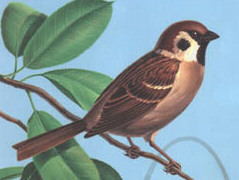 References Lang, Anthony (1992) The Eurasian Tree Sparrow population in North America: Evolving and expanding. Birders Journal, vol. 1, 298-307. Widmann, Otto (1909) Summer Birds of Shaw's Garden, Twentieth Annual Report of the Missouri Botanical Garden, 59–62.